Never has a footballer had such a positive affect on society in general than George Best. Born on the 22nd of May 1946 in Northern Ireland, Best went onto to become one of the most loved and adored footballers that the country had ever seen. He also went onto become one of the most volatile and self destructive footballers the game had ever seen too. Georgie Best was discovered as a scrawny 15 year old in Belfast by United scout Bob Bishop. Bishop contacted the United manager in 1961 with the now legendary words of ‘I think i’ve found you a genius’. 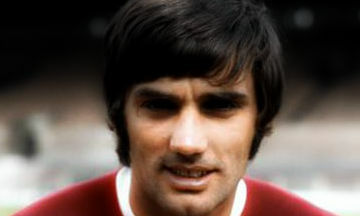 George Best was eventually signed by chief scout Joe Armstrong and the legend had began. Best made his first team debut two years later against WBA. A strike by David Sadler giving United a 1-0 victory over the midlanders, and a taster for Best as to what was to come who would score his first of his 137 goals for United against Burnley on December 28th 1963. Best scored a promising 4 goals in 17 appearances in his first full season (1963/64) and at the age of 18 in the 1964/65 season he scored an impressive 10 goals in 41 appearances. A great return from a player that had so much potential on show. The thing with George Best is, he was literally the complete player. Right foot, left foot, could head the ball, could track back and could tackle. He was also the provider of some excellent through balls and the scorer of great goals. Most noticeably his greatest asset was his sublime dribbling ability that only a few players (Garrincha, Cruyff and Maradona) are born with. Manchester United and Best went on to win the 1964/65 league title and give United their 6th league title. However, what some consider his finest performance came a year later when United smashed 5 passed helpless Benfica to complete a 8-3 drumming of the Portuguese champions in their own back yard. Best was then famously dubbed “El Quinto Beatle” – the fifth Beatle. Manchester United would then be eliminated by Partizan Belgrade in the Semi Finals of the European Cup, but their time, along with George Best’s, would come. At the age of 21 George Best was, even at such a young age, in his prime and had knocked up an amazing 28 goals in 41 appearances for United in the 1967/68 season. As mentioned previously, Best was also a superb provider of assists and setup the semi final goal against Real Madrid for Bill Foulkes to score and send Manchester United to their first European Cup final. Manchester United against Benfica took place at Wembley on 29th May 1968. This game marked 10 years after the Munich air disaster and the pinnacle of the third and final great team from the legendary manager, Sir Matt Busby. George Best lined up in outside right and was tightly marked by the Benfica players. Although Best didn’t have as much creative freedom as he did against Benfica three years previous he produce a moment of magic late in the game. United had taken the lead with a 53rd minute goal from inspirational captain Bobby Charlton, but United where clawed back to 1-1 when Jamie Graca scored in the 75th minute. Legendary forward, Eusebio, who had lit up previous tournaments with his sublime goals and sheer power, had an opportunity to win the game late on in normal time, however the bravery and shot stopping ability of Alex Stepney foiled the magnificent Portuguese front man. Extra time was upon the players and in the 93rd minute a stroke of genius from the young Irishman. George Best received the ball via a flick on after a long punt forward from Stepney. He then proceeded to nutmeg the on coming defender, open his body upto the right and round the keeper by checking to his left (Best’s) with the ball. He then proceeded to stroke the ball into the empty net with his left foot and United where 2-1 up. A quite brilliant piece of individual brilliance and made out of nothing. It has been said that he had wanted to bring the ball up to the line, get on all fours and poke the ball across with his head. He however opted against it due to the retreating Portuguese defence. An legendary piece of imaginative genius from the great showman himself. Manchester United went onto score two more goals and lift the European Cup. The first time for the club and the first English team to do so. Sir Matt Busby had finally been crowned King of Europe, and his creative genius had been crowded the prince. Best’s career never reached the heights of the 1967/68 season, both performance wise and in goals. The demise of the genius would also coincide with the demise of Manchester United who would be relegated in the 1973/74 season – a mere six years after being crowned European Champions. There where iconic moments later in his career such as the goal against Sheffield United in the 1971/72 season, where Best beat a whole host of players before rifling the ball past the keeper. His celebration would become an iconic memory of a sheer genius. Best went on to play for a number of other clubs having fallen out with the then United manager, Tommy Docherty. These clubs included Stockport, LA Aztecs and Fulham. However, it has to be said that at the young age of 26, George Best’s greatest days where behind him as he left Manchester United forever and embarked on a lifestyle that would eventually be his downfall. Sadly, George Best passed away on 25th November 2005 due to a lung infection and multiple organ failure. It was well document throughout the years the Best was an alcoholic, and couldn’t beat the habit. His addiction eventually killed him at the young age of 59. The country mourned for a man who was quite literally one of the greatest entertainers the country had ever seen. He defined an era, a generation and at times a football club. He will forever be remembered for his amazing footballing exploits and his unique footballing style and ability. Best player the world to me.